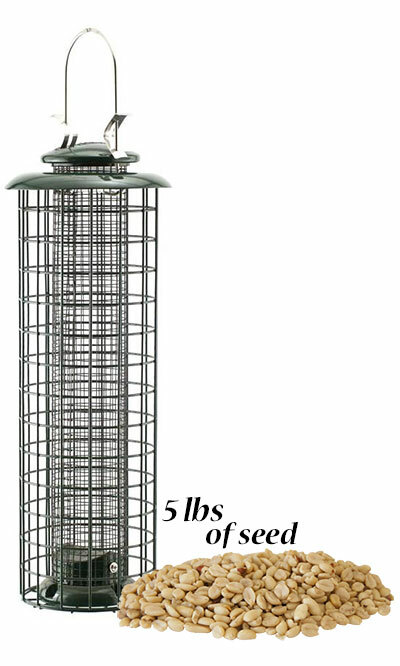 Discourage squirrels from reaching the peanuts offered to your backyard birds using the Woodlink Caged Screen Tube Bird Feeder with Peanut Splits. Using a caged feeder can often keep large birds and squirrels from pilfering seed, while enabling small songbirds to dine comfortably. This fantastic, stainless steel mesh seed tube holds 0.75 quarts of the included Raw Peanut Splits, and small birds can cling onto this mesh and pull a few nuts out through the 0.25" square openings. A powder coated, dark green metal cage surrounds this reservoir, and the 1" square openings are great for small birds. An internal baffle at the base of the seed tube ensures it empties completely, and small holes on the bottom offer drainage for any captured water. Locks atop the green metal roof prevent squirrels from lifting the lid, and the sturdy metal hanger makes placing this unit simple. The feeder may also be displayed on a 1" outer diameter pole (not included) for extra versatility. Offer small birds peanuts and a private dining spot with this Caged Screen Tube Bird Feeder with Peanut Splits. Note: The locks on the feeder roof may differ from those shown.